This is so exciting! Your glyphs are expressive, beautiful and damn near perfect. I will be back in touch. Spring sprung all over me. This is a great idea, Debra – I especially like the Flint glyph. If the T-shirts are available (or become available) in black or blue colours, I’m definitely ordering one! 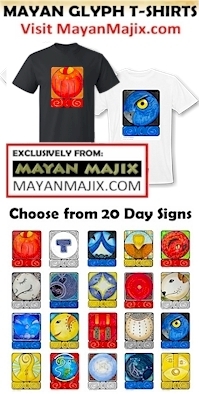 All the best with sales at the MayanMajix community! FYI – We’re now offering black shirts!! Thanks for the update – that’s good news! After the T-shirts take off and are successful…….how about print the images on high quality paper to be framed as art.???? ?